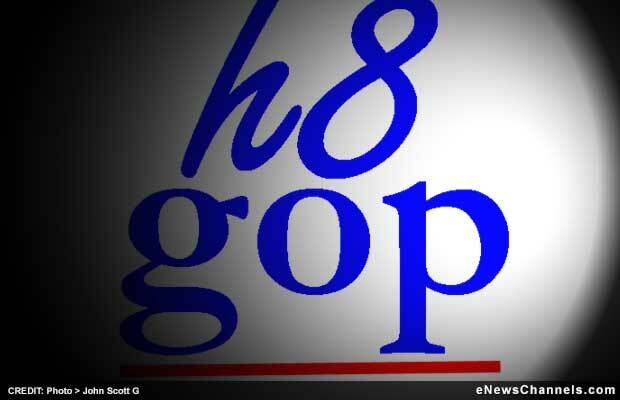 Home ARTICLES and Columns Opinion: Is Conservatism Infectious? Sixty million people voted for Mitt Romney in the 2012 race for President of the United States and since that candidate was one of the least-qualified in modern history it should be obvious that the ranks of conservative voters are huge. And yes, “rank” would be the operative word. Questions enter the minds of all sentient beings because of the strange behavior of so many American voters. Very well-thought-out philosophical questions like: Holy crap WTF?! And: What causes people to make such an odious choice? And, most importantly: Is there any danger of conservatism being infectious? Answers to the first two questions may be found in Chris Mooney’s “The Republican Brain” (reviewed here https://enewschannels.com/2012/08/08/enc15140_190927.php/book-review-the-republican-brain-by-chris-mooney/ back in August, 2012). But the answer to the third question is “possibly.” Wait, don’t panic! Sure, it is frightening to think you may have caught a strain of conservativitis, but there is a painless way to find out for sure. We have devised a handy-dandy test that may be self-administered in less than ten minutes. You’re welcome. Please answer the following questions. Note: multiple responses are acceptable. a) A strong and logical grasp of the principles of democracy. b) A basic foundation in humanity, empathy, and concern for one’s fellow human beings. c) A condescending attitude and the gall to keep mentioning The Bible even when not relevant. a) Taking the time to assess the various options available on the pertinent aspects of an issue. b) Using the factual outcome of prior actions in developing answers to new challenges. c) Doing whatever the preacher-man tells you. a) A demagogue, a despot, and a degenerate. b) Architect of Fascism and dictator of Italy, 1925-1945.
c) A forceful speaker with some interesting ideas. a) A demagogue, a despot, a degenerate, and insane. b) Popularly elected (with 33% of the vote) but maneuvered to become dictator of Germany’s despicable Third Reich, 1933-1945.
a) A political philosophy insuring that elected representatives carry out the will of the people. b) The fundamental principle of the United States of America. c) Just another name fer the party we ain’t in. a) A social and economic practice that places more value on the entire community than on individual or corporate success. b) A political theory that easily interacts with democracy in an intelligently-run society. c) Any democratic idea that upsets big corporations. a) An economic practice that puts one aspect of society in charge of everything. b) A political practice that conflates the state and commerce, either with government in charge of business (as under Mussolini) or with business in charge of government (as republicans are attempting to accomplish). a) The fundamental document that established the concept of the United States of America. b) The document outlining our nation’s basic principles and laws as well as determining the powers and duties of the government while guaranteeing the rights of the people. c) An important chapter in The Bible. a) Something that should be available to all people. b) Long overdue for women, minorities, and the LGBT community. c) A product of Commie agitation. b) Counter to the principles of America. c) Kinda funny words that we don’t need to know nuthin’ about. a) Demagogues bent on trashing the tenets of democracy. b) Purveyors of horribly confused and often contradictory positions that have a strong appeal to ultra-rich corporations and total morons. c) Forceful speakers with some interesting ideas. a) A shining beacon of opportunity. b) The greatest country in the history of the world. c) A and B once enough non-white people are prevented from voting. SCORING: You get ten points for each A and B response and one point for every C response. Since both A and B answers are correct, most virtuous human beings will obtain a score between 130 and 260. If you scored between 13 and 100, you are infected with conservatism and it is hoped that you will do at least one of the following: a) Get an education; or b) Study U.S. and world history. Failing that, please: c) FOAD for the good of humanity. This opinion piece is Copr. © 2013 by John Scott G and originally published on eNewsChannels.com – all commercial and reprint rights reserved. 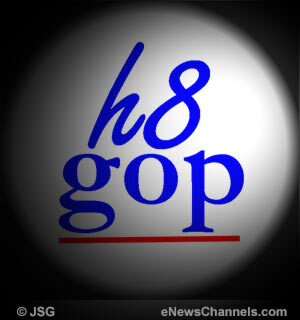 “H8 GOP” button illustration is Copr. © 2013 by JSG. Read more from JSG at: https://enewschannels.com/author/scott-g-the-g-man/ .